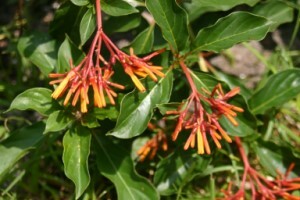 Firebush is native to central and south Florida hammocks and open disturbed areas. It's a fast-growing, semi-woody evergreen shrub that grows to 6 to 12 feet tall and 5 to 8 feet wide. The leaves have red veined and the stalks are red. The one-inch long tubular flowers are borne in clusters. The small berries progress from green to yellow to red to black. Flowers and berries are present year-round. Firebush does best in full sun but will grow in shade although it will be leggy and not bloom as much. It isn't picky about soil and although it will need weekly watering for the first year or so, once established it is moderately drought tolerant. It's root hardy, dying to the ground in a freeze, but quickly coming back. Firebush is commercially available and has many uses in the landscape, particularly as part of a mixed shrub border or screen, in foundation beds, and as an accent. Hummingbirds and many butterfly species are attracted to the nectar of firebush and birds are attracted to the berries. 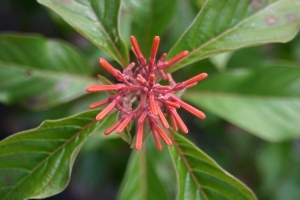 Dwarf firebush, Hamelia macrantha, is also available at garden centers. It's a native of Costa Rica that reaches about 4 feet tall and wide. The leaves are smaller and glossy and the flowers range from red to yellow. I have seen these mixed in with firebush and labeled only as "firebush" at a local garden center. They are also attractive to birds and butterflies but if you're looking for native firebush, the yellow flowers are the key to differentiating the two. Plants of the madder family, Rubiaceae, attract a variety of wildlife.